NOTE: This book is also printed under the title Backgammon for Blood by Chris Bray, 2007. A new 2012 edition has changes to positions and analyses produced with the new computer software, Extreme Gammon. There is one new chapter on responses to the opening rolls and the chapters on computers and online play have been considerably revised. 14. Where to from Here? COVER: Backgammon to Win: Play like a pro both online and off introduces beginners and those who haven't played for years to the knowledge and reasoning needed to play the game well. Backgammon expert Chris Bray takes you step-by-step through the many strategies available to the backgammon player, helping you to know which moves to make and how to change your game plan to react to the luck of the dice. Starting with the basics, such as setting up the board and the rules of the game, by the end of the book you'll be confident playing and developing your own style. • Covers the whole game, from opening rolls and mid-game strategies to races and endings. • Features information on playing online for money or fun, in tournaments and in chouettes. • Teaches you how to use the doubling cube, pip counts, match equity tables and probabilities to improve your playing style. With clear, precise text and illustrations providing direction at every stage, Backgammon to Win has everything you need to be one step ahead of the game. Backgammon is the ultimate head-to-head gamean action-packed race to the finish with an addictive mix of luck and skill. It's easy to pick up the basics, but this is a game that continually surprisesthere's always something new to elarn, and the Internet has opened up a whole other world of gaming opportunities. In Backgammon to Win, Chris Bray, backgammon columnist for The Independent, reveals the tips and tricks needed to help you play the game like a pro, whether you want to make serious money in online tournaments or just play for fun at a board with friends. While backgammon can be lost or won on the throw of the dice, tactical moves and game plans can help you adapt your play to deal with whatever comes your way. With chapters on opening rolls, mid-game strategies and races and endings, his step-by-step suggestions, sample game illustrations and easy-to-follow text hae everything you need to get to grips with the game. The different ways to play backgammonfrom tournaments and chouettes to computer and online playare all covered, as are the secrets of making the doubling cube work in your favour. Insightful and informative, Backgammon to Win: Play like a pro both online and off is the ideal introduction to this dynamic and challenging game. 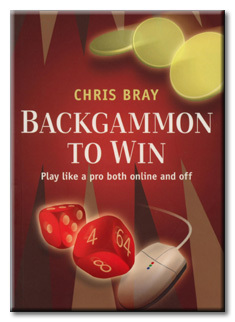 AUTHOR: Chris Bray has been playing backgammon for over thirty years. A keen money player, he is ranked in the top five in the UK and regtularly competes in the World Championships. Always fascinated by the history of the game and its teaching, in 1994 Chris became the first ever backgammon columnist for a major newspaper [Really? Maybe in the UK.] when he started writing for The Independent. Years later, he still produces a weekly column. As well as playing and writing  he is the author of Backgammon: An Independent View and What Colour is the Wind?  Chris also gives seminars on the game and is an accomplished after-dinner speaker on backgammon and sports psychology.